Yesterday we got about a foot of snow in Philadelphia, and most of us are enjoying a snow day today as the city digs itself out. Throughout the snowstorm yesterday, sitting in the comfort of my home watching the fat flakes accumulating on the sidewalks and cars, I was grateful I didn’t have to go anywhere. After dinner, though, I put on my boots and bundled up to take a walk around the block. 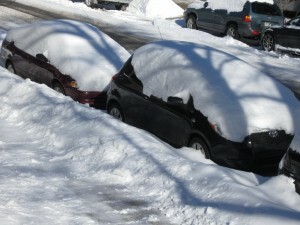 The neighborhood was peacefully quiet, the only sound that of a snow shovel scraping the sidewalk in the next block. When I got to the corner I stopped near a street lamp and watched the flakes swirling in its light. Mesmerized by their random movements as they swooped this way and that on the currents of air I settled into that experience of timelessness that is always present but which I miss when I’m immersed in the daily tasks of life. Along with most everyone else I know I love snow days, and I love that we call them that — snow days. The name plainly acknowledges that snow has claimed the day for itself and nature has wrested out of our industrious hands all of our best laid plans. Snow days are a time of forced respite, and in our culture that often seems to be the only kind of respite we think is valid. A snow day insists that we quiet ourselves for a while and inhabit our inner spaces, and it invites us to marvel at the magnificence of nature that all of our paved streets and skyscrapers are ultimately powerless to keep at bay. The soft white blanket that descends over the city imposes its own reality that is not beholden to human design. Most of the time we dwell within an artificial world that has been constructed by humans, a world of freeways, manicured landscapes, indoor plumbing and central heating. It is a world that lulls us into a sense of being separate from nature and even instills in us the odd arrogance that we are her masters. But we are not nature’s masters. We are nature’s offspring, and our existence on this planet is by sheer grace. Watching those snowflakes swirling beneath the streetlight last night — such a deceptively gentle power descending from the heavens, commanding our bustling city to stop — I felt grateful, and strangely nourished being in the presence of such an untamed reality that none of us controls. May you also be touched with that wildness at the heart of nature, a wildness that your own heart remembers and your soul hungers for. Lovely, Patricia – you have made my love of snow days even deeper! Thanks, Julie. I hope you are enjoying this one, with the sun shining so brightly on all that sparkling snow. In my mind I was taking that walk with you in the snow which is one of my greatest joys. Sue, that would have been marvelous! I love when the city is made still by inches of snow. It gives me the excuse to do nothing. I very rarely allow myself to do nothing. However, this snow was different. While it fell, my husband was undergoing emergency triple by-pass surgery in Abington Hospital and I was wondering how I was going to get back into the city and park the car. Then, my clear thinking son, got me a hotel room in Willow Grove so I slowly traveled 3 miles up Old York Road to a warm room. So, there I was with a husband in the ICU and afraid of the travel and missing the beauty of the snow storm……only to give gratitude for the many people who have reached out to us then and now with prayer and food and sitting with my husband as I attend to work. And then there is the Resilient Christmas, which I read before When the City Claims Snow – because life has been a little topsy turvy – and know that my husband’s operation yielded new growth in his life and mine. This this too long for a comment? Lynne, you all have been very much on my mind lately and I’m so glad all went well with the surgery. I understand the anxiety that comes when a storm hits at such an inopportune time when you don’t have the luxury of staying at home and watching the beauty. May you continue to be blessed by friends and loved ones surrounding you both during this time of recovery.